No Man’s Sky has seen a massive surge of new and returning players following the launch of the big NEXT update yesterday. 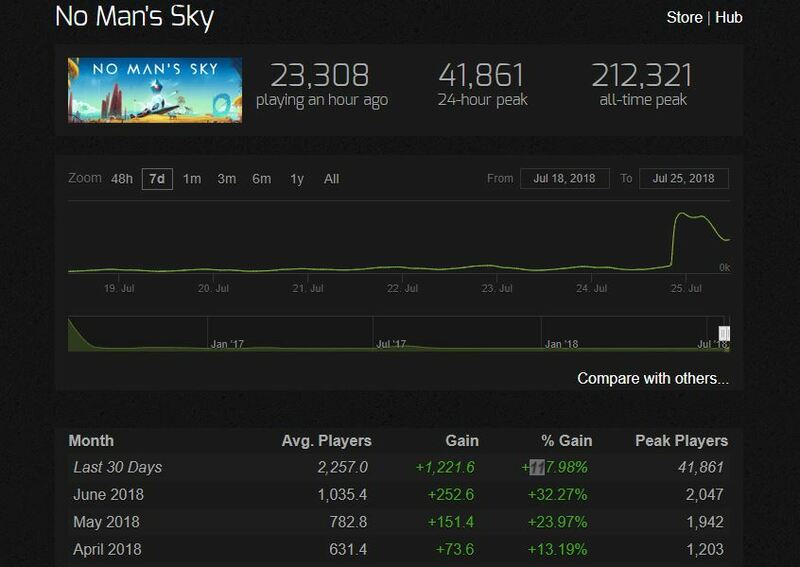 You may remember that No Man’s Sky famously had one of the biggest launch day player counts ever on Steam, certainly 2016’s biggest with nearly 213,000 players at one point. It wasn’t long after that the player base declined sharply, nosediving to a mere 2,123 players a little over a month from launch. But No Man’s Sky is back in the news again, thanks in large part to the game’s massive NEXT update, which added third-person gameplay, co-op multiplayer, unlimited base building and a host of other new and requested features. Together with the currently active 50% off sale, the game’s concurrent player numbers on Steam have seen a big jump. One day before NEXT’s release, No Man’s Sky had an average of 4,000 concurrent players. Yesterday, the game jumped to over 41,000 players, its highest peak since the launch disaster. The game has been steadily gaining players, too, with nearly a 118% growth rate in the last 30 days. While the jump is big, it’s still a far cry from the 200,000+ the game saw at launch. All of these stats are available on Steam Charts, but you don’t even need that much data to know that No Man’s Sky is popular again. A trip to Steam’s stats page shows that, at the time of writing, the game is just two places shy from the top ten. With NEXT’s release last night, No Man’s Sky was comfortably in the top ten – a far cry from the sort of player activity it has been seeing since the numbers jumped off a cliff in 2016.